दिल्ली सेजालंधर NH1 पर 375 किलोमीटर पर स्थित हैजालंधरसे कपूरथला 19 किलोमीटर के आसपास है आरसीएफ 8 किलोमीटर कपूरथला / फिरोजपुर सुल्तानपुर लोधी रोड पर स्थित है जालंधर - फिरोजपुर रेलवे लाइन के साथ कपूरथला जिले में Hussainpur के रूप में जाना जाता है जगह में स्थित है. By Train Jalandhar falls on the Delhi-Amritsar as well as Delhi-Jammu Tawi main line of Northern Railways. Almost all trains running on these routes have a stoppage either at Jalandhar City or Jalandhar Cantt Railway Station (if not both). 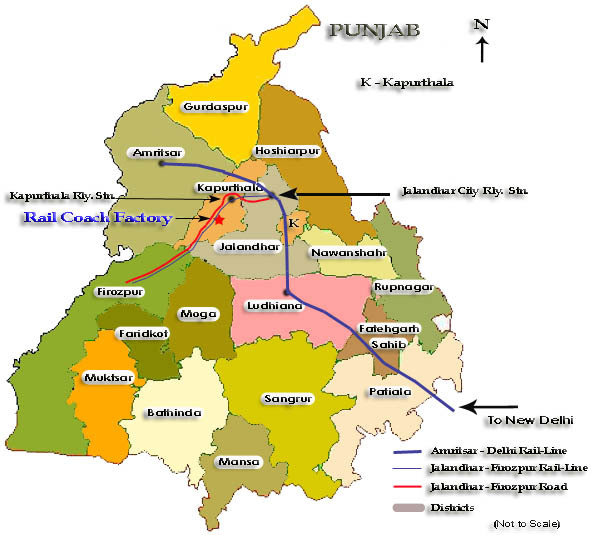 Kapurthala lies on the Jalandhar-Firozpur section. All trains – passenger or mail - running on the Jalandhar-Firozpur section have a stoppage at the RCF Halt. Detraining here, one would find oneself opposite to the RCF’s Main Gate/Entrance.